To Murder A Saint – Win An Audible.com Copy!!!! Click to Win!!!! LINK NOW UPDATED AND WORKS CORRECTLY! 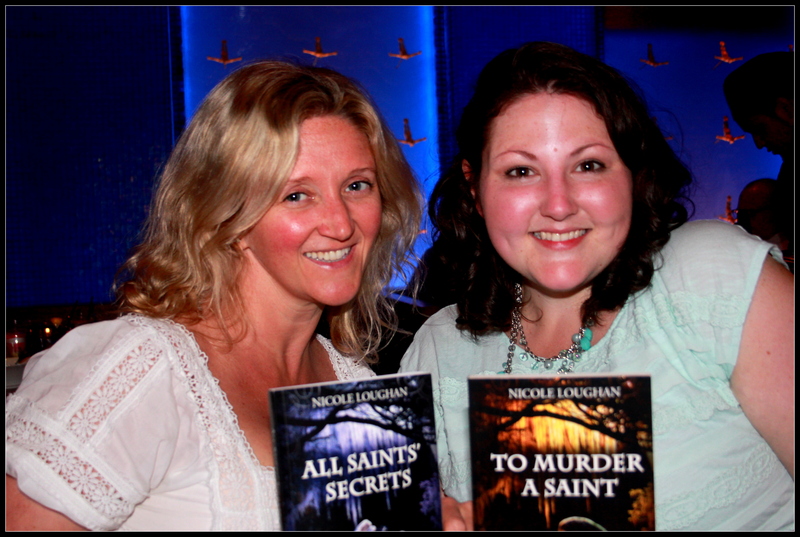 Now is your chance to WIN a copy of To Murder A Saint by Nicole Loughan! Nicole just published her Audio version of her book at Audible.com. Read by Suzy Lexington the story leads from the swamps of Louisiana to New York City, and back to Louisiana again as Fanchon, one of two lovely girls from the swamps, searches for her best friend Josephine’s murderer. A tightly written story imbued with ambiance, it is a wonderful beginning to the Saints Series! The ground is too wet…If you bury the dead here, they can come back.” Her father always warned her that the bayou was a mysterious and dangerous place. She never suspected that the greatest danger of her life was lurking in New York City. Before their bags are unpacked one of two Cajun girls in fresh from Louisiana is found savagely murdered in New York. All the clues point to a wild animal, a perplexing development for a third floor apartment. Lacking a suspect the police accompany the murdered girl’s French speaking roommate back to her reclusive Southern Louisiana town in search of a lead. They are met with a warning that the killer is not finished yet and learn that this is not the first mysterious death in the family. It’s probably a bad sign on a first date that my mind wandered to how best to bury somebody. Namely it wandered to burying Jason Stepwald: lumpy, chubby, balding insurance salesman, Jason Stepwald. Not handsome, full head of hair, marine ‘Semper Fi Jason’ as advertised on his My Date profile page. With those words in my mind I saw Jason lowered into the ground, a respectable burial, and then his decayed corpse bubbled back to the surface, his tongue sticking out. It was the very color of the gelatinous goo currently occupying his mouth. My attention came back to living Jason when I inhaled a pungent fish smell. Jason decided that I might try one of his half shell delicacies if it was swirled within an inch of my face. “Where I come from we call ‘em oysters,” I told him, pushing his hand away. I noticed that his hands were soft. My dad always said nobody dates a man with soft hands. His eyes grew wide and some of his red wine dribbled down his chin. The red wine glistening on his neck was just too much for the dead Jason image in my head. I had to turn away from him or I was going to lose it. “I didn’t mean to upset you or anything like that,” he said. “I have no idea,” I said resting my head on my hands, giving up on getting a chance to speak. After he steered the conversation to insurance yet again I couldn’t take it. “I have to use the restroom,” I said, walking away before he could reply. And don’t miss Nicole’s second volume in the Saints Series! All Saint’s Secrets is out NOW!! The bayou holds many secrets. One of them is what really happened to Lisette, a beautiful Creole teenager who died on the last day of school. Everybody in Fanchon’s reclusive bayou parish knows Lisette died in a boating accident, but when the police take a closer look, they unearth the dead girl and find a surprise in her grave. All Saints’ Secrets is the sequel to To Murder a Saint. It is highly recommended that the Saint books be listened to in order. You may know her as the syndicated humor columnist “The Starter Mom.” Nicole is a graduate of Michigan State University and an award winning Journalist, recognized by the Michigan Press Association as a top feature writer. She writes for two daily newspapers in the greater Philadelphia area. To Murder a Saint is the first book in the Saint Series. All Saints’ Secrets released in August. It is recommended that the books are read in order. Nicole loves a mystery. Her favorite female sleuths were dreamed up by Charlaine Harris and Janet Evanovich. She draws inspiration from the classics too such as Sir Arthur Conan Doyle and Edgar Allen Poe. She said she has to mention her first experiences with New Orleans came from the venerable Anne Rice. The daughter of an American diplomat father and a model mother, Suzy Lexington has been traveling the globe since she was born. Currently, Suzy is working as a journalist and living in NYC. Click the Audible logo to see Suzy’s other works. But when I click on it, it takes me to my preview page…. I get so tired of this sort of thing… will contact rafflecopter and see if that is what is going on. I will give away a copy of the book to the only person who go to the link for the last giveaway I did, then will purchase another copy of the book to run another rafflecopter I suppose. I know you have run them before, any thoughts? When I try to run to facebook page it doesn’t let to to facebook, says i don’t have a facebook page. followed their instructions on that too, no juice. sigh. i wanted to work on my hoffman challenge quilt today!